Funded by U.S. National Science Foundation REVSYS grant (DEB-0919333, local link, NSF link). Torsten Dikow traveled to Australia in order to conduct field work and visit three museum collections to study Australian Apioceridae, Asilidae, and Mydidae. Torsten first traveled to Perth where he visited the Western Australian Museum to study type specimens of several interesting Mydidae and in particular Neorhaphiomidas. 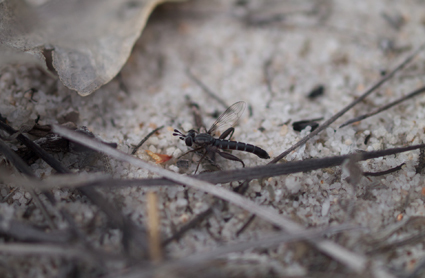 He then spent six days in the field in south-western Australia in search for Neorhaphiomidas (Mydidae: Megascelinae), which he collected at Yanchep National Park and Yalgorup National Park. The specimen he collected at Yalgorup key out to Neorhaphiomidas pinguis Norris, 1936 while the series of four specimens collected at Yanchep National Park doesn't key well in the most recent key to this genus by Paramonov (1953). Torsten spent one day in the field with Jean and Fred Hort of Swan View near Perth who are outstanding naturalists taking excellent images of Diptera and other insects (see their flickr photostream). 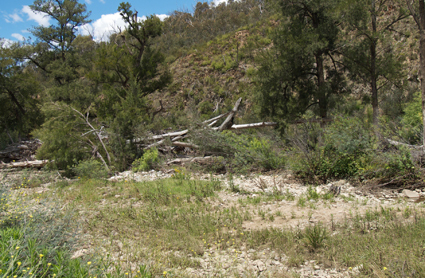 They took Torsten to several places in Wandoo National Park and observed and collected two Mydidae species (Miltinus minutus Mackerras, 1928 and Miltinus stenogaster (Westwood, 1841)) as well as three Apiocera species (Apiocera pica Norris, 1936, Apiocera minor Norris, 1936, and Apiocera longitudinalis Paramonov, 1953) along with several Asilidae species. Several species of the genus Bathypogon (Asilidae: Bathypogoninae), important for the REVSYS grant as this genus is related to Carebaricus from Argentina were collected elsewhere in south-western Australia as well as other beautiful robber flies including Chrysopogon albopunctatus (Macquart, 1846) (Asilidae: Brachyrhopalinae). All collected species are of importance for his NSF REVSYS project. Miltinus minutus Mackerras, 1928 photographed in the field at Wandoo National Park (32°00'12''S 116°31'43''E). Torsten then studied the extensive insect collections at the Australian National Insect Collection (ANIC)in Canberra where he also met with Co-PI David Yeates. Here Torsten was able to identify an undescribed species of yet another rare Mydidae genus named Anomalomydas (Anomalomydinae) from the Northern Territory. A one day field trip to the Cotter Creek area near Canberra resulted in several other Asilidae species as well as a single Apiocera species. 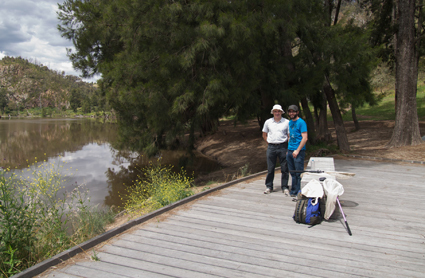 Field work along Cotter Creek at Cotter Bend picnic area (above) and Murrumbidgee River at Casuarina Sands Reserve (below) with David Yeates (left) and Brian Lessard (right). 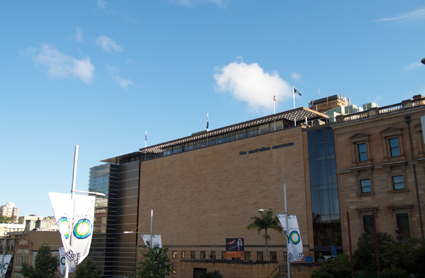 The last stop on this trip was to visit the Australian Museum in Sydney, where several type specimens of Mydidae were photographed and the extensive formerly private collection of Asiloidea of Greg Daniels was studied as well.